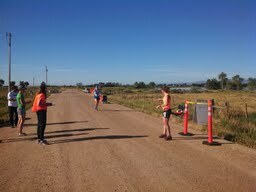 By the time we headed out on our second set of legs, I was tired of porta potties. It seemed like I always had to wait in line and for what? To pee in a nasty, smelly hole. Then I had to run out and slather myself in hand sanitizer. I try to avoid porta potties at races at all costs. Not only can I run 26.2 miles without stopping at a porta potty, but it also appears that I can make it through 70.3 miles without using one. However, I was unable to hold my pee for 30 hours. The worst is when I am at the park with my girls and my middle child has to go to the bathroom really bad. I would rather have her pee her pants on the speedy drive or walk back home. Enough about those dang porta potties! We were off on our next mission. To run as fast as we could before the darkness rolled in. Well, I already knew I was screwed because I was sixth in line. It was going to be pitch black before I ran my leg. I was kind of jealous of the person who ran at dusk and then at dawn. But then again, that is when the wild animals like to roam free (well, I know it is a bad time to go swimming because sharks love to hunt at dusk and dawn). However, I was definitely NOT jealous of the hills that my teammates had to run. Switchbacks and pure elevation gain were the theme of the runs leading up to my leg. Even driving on the road was insane because the van was up and down and all over the road. I almost thought that the runner would catch up to us before we made it to the exchange because we were driving so slow. I kept expecting my back to give out while riding in the van… not during a run. Sure, it was pitch black at 11:00 PM when it was my turn to get out of the van. However, it appeared that the terrain was being kind to me because I only had one mile of steep climbing followed by some mellow inclines. My teammates pushed me out the van and told me to get on my merry way. They said something like “you are okay, right?” and then they took off into the darkness. I was left with my headlamp and flashing red light with not a soul in front of me nor behind me. Where did all of those runners go?? I trudged ahead moving quickly because the adrenaline (caused by fear) started to kick in. I heard sounds coming from all directions, but I refused to shine my light into the surrounding hills for fear that some beady eyes might be glaring back. Next thing I know I hear music. It was getting closer coming up from behind. I looked back and saw a white light bobbing up and down. It got closer and the music got louder. It was some dude wearing tye-dye pants and a long sleeve tye-dye shirt with his classic rock music blaring. I said “nice outfit” as he quickly passed me. As he took off out of sight I thought about how smart it would have been to bring along some blaring music. Darn it. I was alone in the dark once again. As I came up the steep hill I saw flashing red lights in front of me. They got closer as I huffed and puffed up the hill. Yep, it was two runners. I passed them, but then wondered if I should slow my pace to stay near them. Nope, that wasn’t an option for me. I kept going and once again I was alone. There is only one mile marker during these legs. It is the one that tells you that there is only one more mile left. I fell in love with those signs. When I saw that sign on this leg I wanted to hug it, but I figured that might be a bit awkward. I kept going and finally saw a very large group of people next to a bar. There were so many people (I didn’t quite understand why) that I had trouble finding my teammate. Finally I was spotted and I was very relieved to offer a high-five. Now it was time for our van to rest while the other van took over. I wondered if I would even be able to snooze because of the adrenaline pumping through my system. We drove over to the high school and parked the van. A few of us slept in the van, while a couple of runners slept inside the high school. Let’s just say I was thankful to have claimed the back seat of the van. But hey, I was the oldest person in our van so I should have some special benefits, right? However, I was lucky if I even got 2 hours of sleep, but at least it was something! 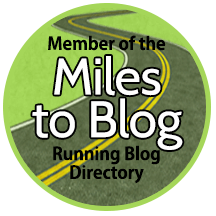 This entry was posted in Running Experiences and tagged competition, relay, running, running at night, what not to say to a runner, Wild West Relay.